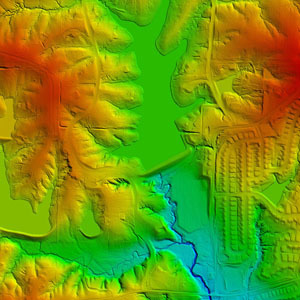 LiDAR (acronym for “Light Detection And Ranging”) is a scanning and ranging laser system that produces accurate Digital Terrain Models that can be used for contour modeling. LiDAR has the capability to provide accurate surface modeling in places previously not possible, returning data accurate up to 0.5 foot. Surdex uses its Leica ALS 70 HP SP3 Aerial LiDAR Sensor equipped with Multiple-Pulse-in-the-Air (MPiA) technology for the LiDAR acquisition. The sensor is a multiple-return LiDAR system capturing multiple ranges for each pulse along with intensity images.